Screen capture from "Animated Peeps"
Each loop starts from a different place than from where the previous loop ended. The second post on this demo will walk you through the process from start to finish. Beginning with MakeHuman, the character will be designed using just mouse clicks. 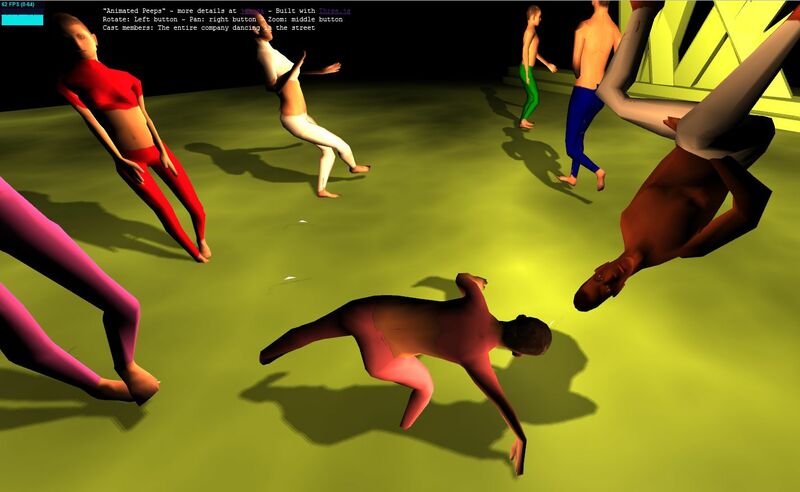 Motions [as motion capture BVH files] will be selected and edited using BVhacker. Designs and motions will be combined in Blender and exported in JSON format for use with Three.js. My guess is that building characters using Maxamo will be just as straightforward. The emergence of characters in apps is important not just for the gaming world but for civilization as a whole. We need tools so that the architect working with Maya or Reddit can be designing while her clients walk through her design. Historians need the tools that will recreate the events of the past - using tools designed and built by historians (as opposed to programmers). And what about books? For most of the history of the book the book has been a combination of text and image. The primacy of books without images is a phenomena perhaps about only fifty years old. With e-readers adept at both text and graphics we will a resurgence of books made correctly. All of this can only be accomplished by straightforward work-flows that can be operated by non-professional programmers. The professional programmers must not let up. This is only the start. There's a lot more to be done. For script-kiddies like me WebGL and Three.js plus all the demos is opening a whole world of power. For programmer with a full CS background the same tools offer all manner of new coding possibilities. Added links to the full series of posts in the tutorial and other minor edits. Did you rock everything in MakeHuman? I am guessing it auto rigs your characters. What of skin weighting? Will the application let you control the weighting of joints? I understand the need and want for photo-realism in 3D. But I truly believe in the uncanny valley. As an artist I want to create something that is not photo real or even something that is hyper real, even now with games such as Minecraft we are seeing a regression to simpler forms and abstract shapes to convey our characters. >> Did you rock everything in MakeHuman? Many steps - but none that complicated. I will go into more detail in the nex post. >> But I truly believe in the uncanny valley. Agreed. Why should we be hamstrung by the stupid limitations of the physical world? Awesome work! I was agonizing about how I was going to do this in my 3D game. I had no idea MakeHuman or BVHacker existed either. Yes, there is definitely a need out there for people like you to blaze trails a little so it doesn't become yak shaving for everyone. :) Kudos, man. Is this the first post in a series? >> Is this the first post in a series? What do mouseless folks like me do?